The pseudonym “Mark Twain” has appeared on 12 novels, 21 short stories, three plays, nine travel books and 10 essays, making him one of the most influential writers in the history of American literature. Samuel Langhorne Clemens, also known by his pen name as Mark Twain, was born on November 30, 1835, in the river town of Florida, Missouri. He was the sixth child of John Marshall and Jane Lampton. He lived in this place of birth until the age of four when the family moved to Hannibal in light of improving the family’s standard of living. His father, John Clemens worked as a judge, storekeeper, and land speculator, but still had trouble with finances at times. In contrast, Twain’s mother was fun-loving, tender, and always laughed as she told stories to her family. 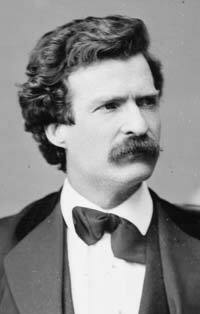 Twain’s father died in 1847, and the family adversity in a hopeless economy saw Mark Twain out of school, which was a situation that apparently shaped his career. Between the ages of four and 17 years, Twain spent his time in Hannibal, a splendid place for a visionary teenager. The Mississippi River soured his eyes with wit and buoyancy to explore beyond the waters. The location had many promising opportunities and sailors with steamboats would arrive several times a day announcing their presence by hooting their whistles. There was also a library rich in world’s literary works. Living next to the river offered many benefits to Twain. He became a professional steamboat pilot with a high-status earning. However, the civil unrest halted traffic in the river, forcing him to head to Nevada and California. Here, he worked his way around and secured a job as a reporter for the Virginia Enterprise and became the best known storyteller. In 1869 his book, The Innocent Abroad, was published and became a bestseller. At the age of 34, he became prosperous once again. In 1870, he married Olivia Langdon, a daughter of a wealthy New York coal miner. In 1876, The Adventures of Tom Sawyer was published and the sequel – The Adventures of Huckleberry Finn – soon followed. Huck Finn required time to intellectualize and Twain put it aside often to do other publications like The Prince and the Pauper (1881) and Life on the Mississippi (1883). Finally, Huck Finn was published in 1884.